For all Ohioans who are still looking for a job, but who can’t find one because Gov. John Kasich can’t create them nearly fast enough even though he has a billion-dollar, hand-picked, private job creation group (JobsOhio) exempt from public scrutiny at his beck and call, keep holding your breath. While reports last week on monthly job creation figures released by the Ohio Department of Job and Family Services (ODJFS) and U.S. Bureau of Labor Statistics (BLS) spawned headlines about a very minor downward tick in Ohio’s unemployment rate, the news buried in the data shows that the governor’s production of jobs after just five months is a paltry 11, 700. As Cleveland research analyst George Zeller explained, this pace puts Ohio on track to perform even slower than it did last year, when Kasich spent a third of the year selling himself as a GOP hopeful for president who promised to do for the nation what he’s done in Ohio. The 2017 rate of job creation, if it continues, will mark an even slower growth performance than Ohio had during 2016, a presidential year in which the great swing state produced the smallest yearly job increase since the Great Recession in 2009. The big factor that’s causing job number crunchers like Zeller to pause is the yearly comparison between the Quarterly Census of Employment and Wages complete count of jobs and the monthly Current Employment Statistics survey. Ohio’s job growth rate for May 2017 improved to 0.71 percent, but that was only 46 percent as good as the national job growth rate of 1.54 percent. “Given all of these major changes, Ohio now has a 54-consecutive-month streak with Ohio’s job growth below the USA national average, including all months for four full years and six additional months,” Zeller told Plunderbund. Zeller explained that ODJFS changes monthly jobs data when more complete data arrives in the Current Employment Statistics at the U.S. Bureau of Labor Statistics. Then once a year in January, BLS and ODJFS review the QCEW’s complete count of jobs. That is then compared to the monthly Current Employment Statistics data. If the monthly data are higher than the figures in the complete count of jobs, then the survey data are revised downward, Zeller noted. If the monthly data are lower than the figures in the complete count of jobs, he said, then the data are revised upward. “This happens only once every year, since QCEW are always delayed several months behind real time, while the monthly Current Employment Statistics come from a monthly survey of Ohio firms,” Zeller said. The revisions for jobs for 2016 went down by whopping 138,100, a very large drop according to Zeller. The massive downward revision produced a final job total for the Buckeye State of a positive 49,700 jobs, or about 4,142 per month. It’s no secret that Kasich loves private sector jobs more than public sector jobs so much that he butted up against staggering opposition in 2011 when he tried to gut pubic worker unions through Senate Bill 5 but got beat back by voters. But Ohio falling behind on public sector jobs, given the anemic performance by the private sector despite Kasich’s claims of “moving at the speed of business” along with a new state attitude, has contributed each month to the state’s subpar performance when compared to the rate of job growth nationally. While on the campaign trail last year, Kasich boasted about how he has his own lane, the “Kasich lane,” and how that lane has reduced state employment after six years of his administration, as if that was a feather in his cap. It might be to fiscal conservatives who still think income tax cuts create jobs and prosperity, when when it only does so for the top 1 percent of the population, but to the other 99 percent, it’s a big reason why Ohio idles in slow-lane. 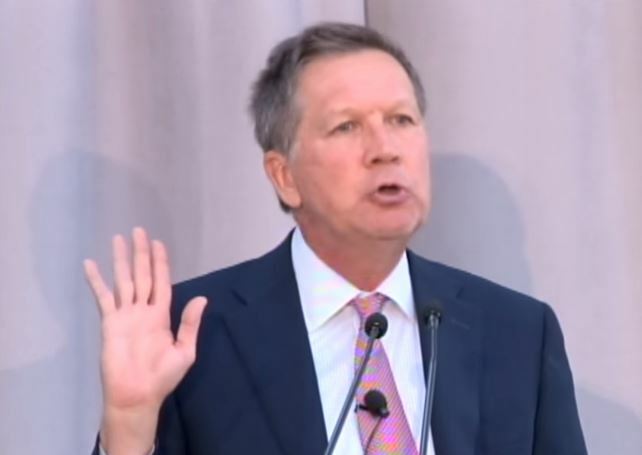 To the chagrin of Kasich and others who worship at the church of the private sector, all of the 6,300 jobs that Ohio gained in May are accounted for by the 6,700 gain in public sector (government) jobs. Zeller noted in his monthly reports the importance of government employment, where cuts over time have slowed down Ohio’s growth.